*IMPORTANT: This assumes that everyone currently enrolled sticks with their current policy next year. If enough people shop around and consider their options, the average premiums for various plans, various companies, in vartious states and nationally could end up being considerably lower (possibly coming in under 10% overall). Again: Do not blindly autorenew! Contact your ACA exchange website/call center (or your insurance carrier, if you're enrolled directly through them) and check out your options before committing to your existing plan! In many cases, there will be a different plan which is a better value for you! At last!! It's been extremely frustrating trying to lock down the 2016 average premium hikes for Pennsylvania, especially because their Insurance Dept. website has actually been very good about posting every requested rate change in an easy-to-read, comprehensive fashion. The problem with PA's rate filings hasn't been on the percentage change side, it's on the covered lives side. I was able to compile enrollment numbers for some carriers but not others...including First Priority, which was requesting a 29.5% rate hike. Without knowing whether they had a huge chunk of the market or not, posting the "average" rate hikes without including theirs was kind of meaningless, since it could potentially jack that average up or down dramatically. So, I finally kind of gave up on it, figuring that even when the approved rates were posted, they probably still wouldn't include the number of covered lives for each insurance company. Thankfully, it turns out I was wrong! Thanks to David Snow for the heads up! 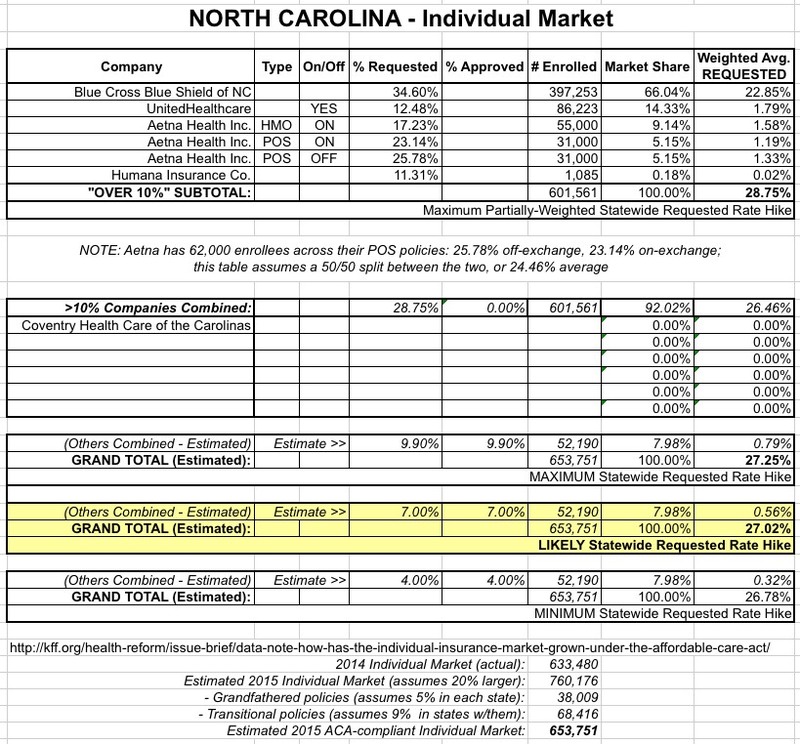 A couple of weeks ago, both Louise Norris and I crunched the South Carolina data and came up with different estimates of the weighted average requested 2016 rate hikes for the ACA-compliant individual market. She used a worst-case scenario and estimated it to be around 16.8%; I took a slightly more optimistic approach and came up with 15.2%. Well, the South Carolina Dept. of Insurance just released their approved 2016 rates, and they ended up pretty much splitting the difference. With 47 states plus DC under my belt, at this point I'd say I have a pretty good feel for the overall national premium rate increase scene; it still looks like around 12-14% nationally on average, ranging from a low of under a 1% average hike in Maine and Indiana to a high of 40% or so in Alaska and Minnesota. Two more health insurers in North Carolina are asking to increase their already-proposed rate increases. UnitedHealthcare, which had requested an average rate increase of 12.5 percent, now is asking regulators to allow an an average increase of 20.4 percent. The range is 2.5 percent to 50.3 percent. Humana had requested 11.3 percent and is now asking for an average of 24.9 percent. Last month I wrote a quick post about the Montana individual market; with only 3 players, all of whom had requested >10% increases, it was pretty easy to plug the numbers in: 22.2%, 29.3% and 34.0%. Commissioner Monica Lindeen's office says the average rate increase for all plans next year will range between 22 percent and 34 percent. For the popular Silver plan, the increase will range from $80 to $88 a month for a 40-year-old person. Lindeen said Thursday the rates affect about 41,000 people. They don't include people who receive federal tax credits or those who have insurance through their employers. The "good" news here is that the affected number is only 41K instead of the 76K I had on record. It's possible that the middle carrier had their rates changed, but overall it looks like the commissioner just signed off on the original requests, for a roughly 26% average increase. If approved as is, this would have resulted in a 33.7% average rate increase, when weighted by market share between the two companies. Unlike many other states, there's no guesswork or educated guesses here; the Virginia Dept. of Insurance SERFF filings are quite complete and straightforward, so I have every company providing individual and/or sm. group coverage listed, both on and off the exchange, with the exact average rate changes and affected enrollee numbers for pratically every one of them. The only exceptions are Piedmont Community Healthcare HMO, whose SERFF filings, oddly, included the enrollee count but not the rate change (usually it's the other way around). In addition, there's a couple of new additions to each (UHC of Mid-Atlantic on the indy market, Federated Mutual on the sm. group market). However, none of these have large enough enrollment numbers to amount to more than a rounding error in either category. Note that there were several crucial missing numbers: I didn't know the actual market share for several companies (I made a rough guess based on an estimate of the total missing enrollments), nor did I know what the requested increases were for Medica or PreferredOne, other than thinking that both were under 10%. For most of the states I'm analyzing, I have hard enrollment numbers for the insurance carriers requesting rate hikes over 10%; it's the remaining companies (the ones seeking hikes of less than 10%) which are generally the big unknowns. Assuming subsidies remain in place, none of the individual plans available in Mississippi’s exchange have requested double digit rate increases for 2016. The only exchange plan requesting a rate increase of ten percent or more is a small group plan from United HealthCare. Rate increases of at least ten percent are published on Healthcare.gov’s rate review tool, and the only individual market Mississippi plans on the list are off-exchange. As I've plugged new states into my 2016 Rate Increase estimate project, many people have asked me whether I'm seeing any patterns emerging in terms of which states are seeing higher average rate hikes vs. lower ones. The main question being asked is whether Medicaid expansion seems to have an impact (and by extension, is there any sort of red/blue political pattern emerging). Until now, I've always answered either "no" or "too soon to tell", mainly because there were still lots of states missing or because so many of the estimates are based on requested increases rather than approved. As of today, however, I've managed to put together at least a ballpark estimate for 44 states (+DC), leaving just 6 states left, so I think I have enough included to look for patterns. Remember: that six states (Alabama, Mississippi, Nebraska, Pennsylvania, Virginia and Wisconsin) are missing from all of the following graphs. It's been awhile since I've crunched the numbers for a new state. As I noted a week ago, I've covered 42 states representing 87% of the total population, so any further changes assuming 100% of current enrollees stay with their current policy are likely to be fairly nominal unless various insurance regulators surprise me and slash the approved rate hikes significantly in a few states. For months now, regular readers know I've spent countless hours crunching the numbers in an attempt to figure out the national, weighted average rate increases for individual health insurance market premiums. I've dug into the numbers for just about every state, filling in hard data where I can and making educated guestimates where I couldn't. For instance, If I found a state where I was able to get a hard weighted average of, say, a 15% increase for 50% of their market, but didn't know what increase the other 50% had been approved for other than it being "less than 10%", I've been assuming around 7% for the missing half, giving a total weighted average of (0.15 x 0.5) + (0.07 x 0.5) = 0.075 + 0.035 = 0.11 = 11.0%.